Today a new regular (hopefully) feature debuts on vanalogue – vintage photo(s) of the month. 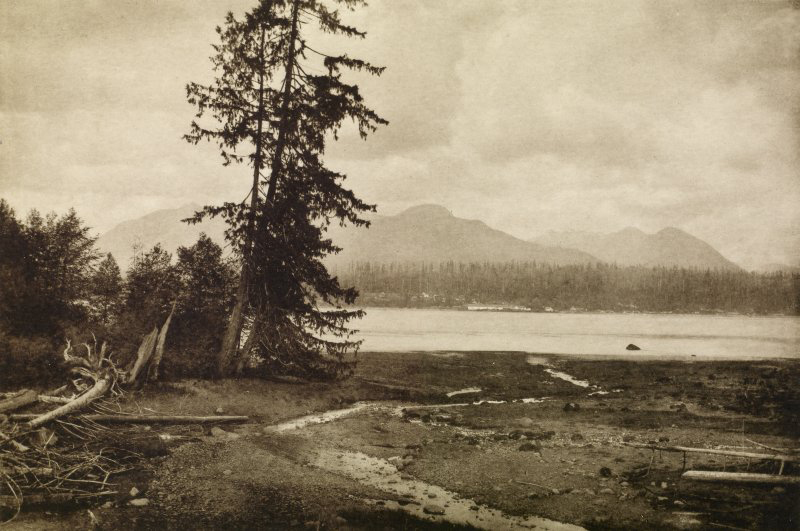 This month I’m featuring the work of Scottish amateur photographer, Erskine Beveridge and some of his photographs of early Vancouver a year before the Great Fire of 1886. This Friday, June 13th marks the 128th anniversary of one of the greatest calamities in the history of Vancouver. A year earlier, wealthy Scottish businessman, Erskine Beveridge was in Vancouver [then known as Granville] documenting a rough and tumble township on the cusp of becoming a city. In March 1885, Beveridge sailed to New York on a business trip to visit a distribution warehouse that had been set up in support of his flourishing textile business. From New York, he traveled extensively around the U.S. and Canada, taking photographs throughout his “wanderings”. A two-volume collection of Beveridge’s photographic reproductions was published (posthumously) in 1922 as Wanderings with a Camera, 1882-1898 (edited by John H. Beveridge). Recent advancements in photographic processes gave Beveridge the freedom to travel with his camera without the burden of transporting a darkroom and chemicals – pre-sensitized glass plates could be easily purchased and processed later. A precursor to roll film, the gelatin dry plate process used by Beveridge was first developed in 1871, and by the 1880s was widely manufactured. 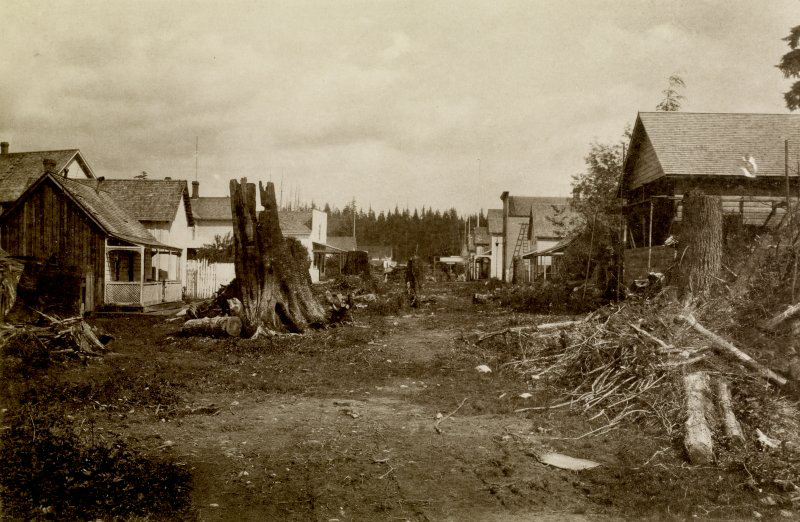 Around June of 1885, Beveridge traveled to British Columbia and took the following photos of the rugged beauty of Vancouver (then Granville) – a city (literally) being carved out of the forest. 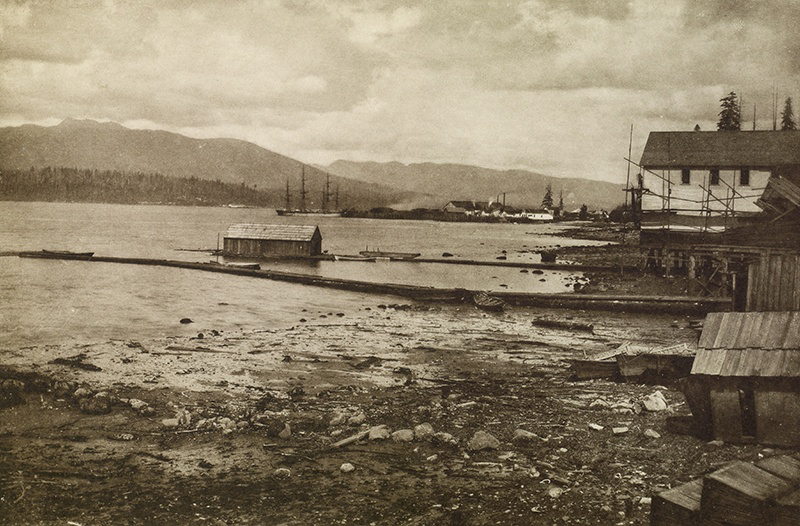 1885 view of Burrard Inlet and Hastings Mill from Granville, now Vancouver, BC. From “Wanderings with a Camera” by Erskine Beveridge Photo: Erskine Beveridge, RCAHMS, DP050375 . 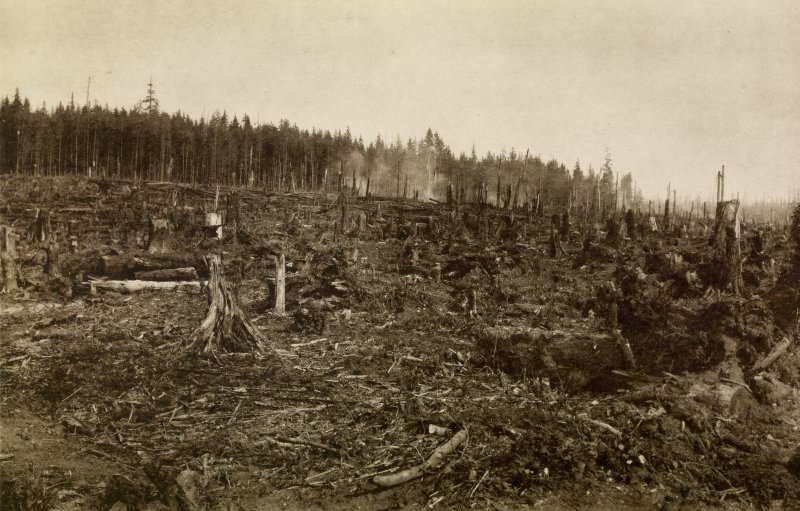 1885 view of cleared forest in Granville, now Vancouver, BC. Copy of photograph titled “clearing for a new city (Vancouver) at Granville.’ . From “Wanderings with a Camera” by Erskine Beveridge. Photo: Erskine Beveridge, RCAHMS, DP050372. On April the 6th 1886, the township of Granville officially became incorporated as the City of Vancouver. 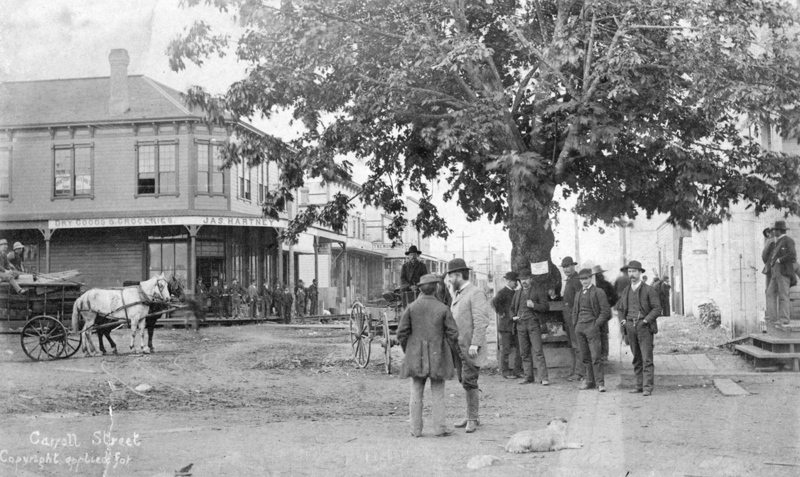 Later the official notice calling the first civic election, on May 3rd 1886, is nailed to the “Maple Tree” in the spot today known as “maple tree square” at the intersection of Water and Carrall streets in Gastown. Vancouver held its first civic election in the “Court House” on Water Street. [In actuality a small wooden cottage in which Provincial Constable Jonathan Miller and his family lived]. A week later, on May 10, 1886 the first Mayor of Vancouver, Malcolm Alexander MacLean, delivered his inaugural address at the first meeting of the City Council. On May 28, 1886 Vancouver’s first fire department, Volunteer Hose Company Number One, is formed armed initially with only shovels, axes and buckets. A fire-fighting steam pump had been ordered by the City of Vancouver, but would not arrive until August 1886! However, that all changed on Sunday, June 13, 1886. 16 days after it’s first Fire Department is formed, one month after its first Civic Election, and 2 months after its official incorporation, the City of Vancouver virtually burns to the ground in less than 45 minutes – though some accounts say it was closer to 20 minutes. In order to clear the land from this mass of debris, controlled slash fires were set. It was one of these fires that at 10:00 am on Sunday, June 13 1886 got away from the C.P.R. men. The day started out calm, but a “freakish squall” from the west changed everything, fanning the “smouldering embers of the clearing fires into flame”. “people of today may gather some conception of the general appearance of all that tract mentioned if they will imagine brush, limbs, and timber to a depth of ten feet or more lying strewn over the ground in an almost solid mass in every direction; a dry spring, and especially with a little wind, an ideal setting for a gigantic fire”. The death toll from the fire is uncertain (there were many transients in the city at that time), but it is believed that as many as 28 people died in the fire. In 1886, the population of the city was about 1,000. By the next morning Vancouver was already beginning to re-build. Tents and building frames were erected and a temporary City Hall was open for business. A month later, armed with a seemingly unending supply of timber, Vancouver, like the mythical phoenix, was reborn out of the ashes. 4 Weeks after Fire. 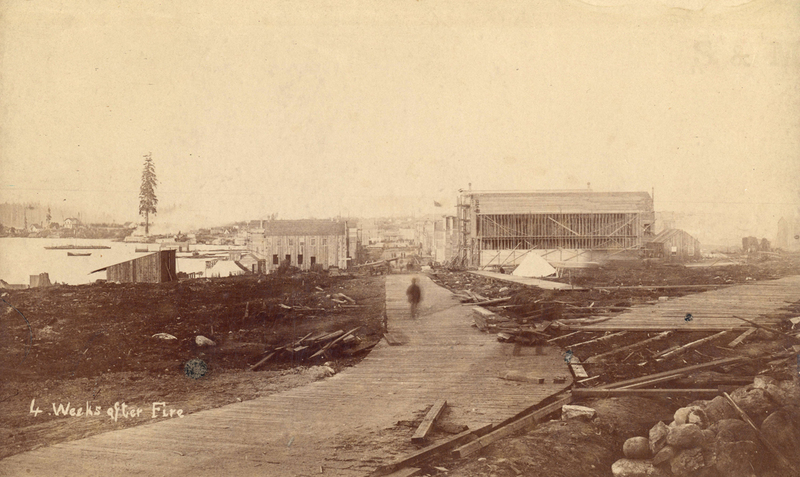 Photograph shows a view looking east from Richards Street toward the intersection of Water Street and Cordova Street, plank roads, buildings including the Greyhound Hotel under construction and Princess Louise Tree. Photo: J.A. Brock and Company, City of Vancouver Archives, AM54-S4-: Str P129. Museum of Vancouver (MOV) – 2 Great Vancouver Fire Stories. 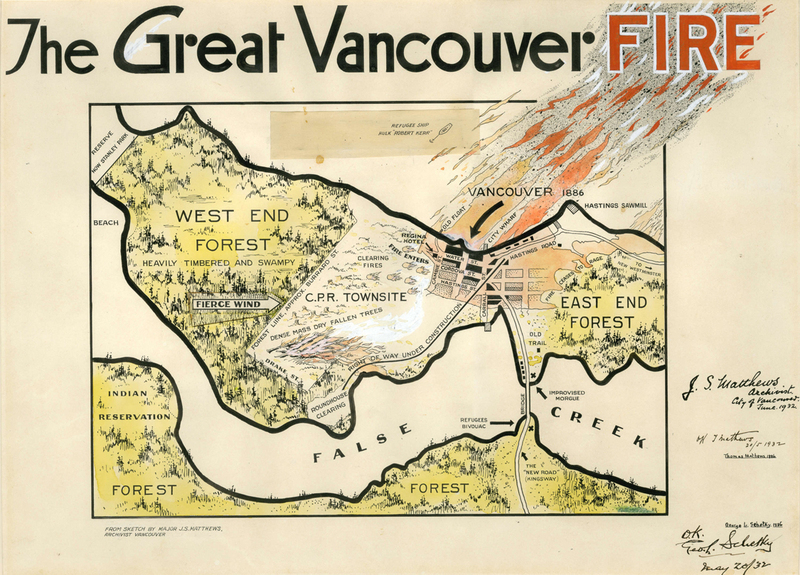 Past Tense – The Great Vancouver Fire. 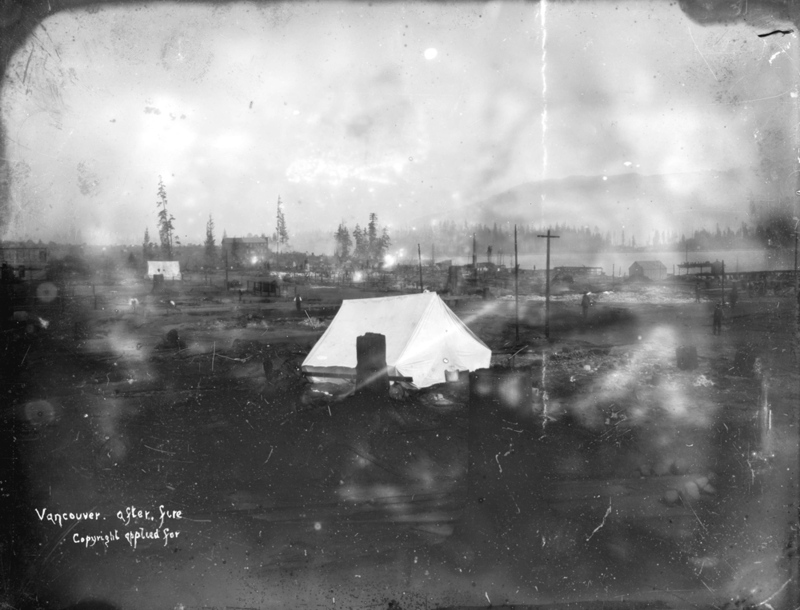 Vancouver Exposed: A History in Photographs – The Great Fire of 1886 by Jacqui Underwood. Fun Fact: June 13 is also known as Vancouver Day (proclaimed by the city in 1929). It marks the day in 1792 that Captain George Vancouver first sailed into Burrard Inlet. Reblogged this on Jo Scott B – Artist. Thanks Jo! I appreciate your comments. Interesting post. Happy Vancouver Day! Happy Vancouver Day to you too Faye! I’m surprised we don’t celebrate it more…it could be a nice little party or holiday!